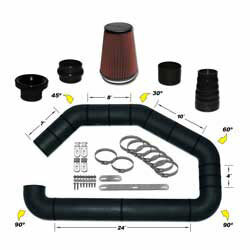 The AIRAID U-Build-It Master Kit is a complete custom air intake kit. The kit allows you to completely replace your vehicle’s restrictive factory air box, paper air filter and air intake tube with AIRAID high-performance air intake components to give your engine more horsepower and torque. This UBI Master Kit features 4 inch outside diameter roto-molded intake tubes with multiple angles and straight pipes that you can cut off in any way allowing you to route the intake to any desired location in the engine compartment. The master kit also includes couplers, hump hoses, a reducer, brackets, hose clamps, hardware, and a premium red oiled AIRAID filter. This product is not legal for sale or use in California or other states adopting California emission standards.